If there is a stretch of road on the island of Nuku Hiva that is straight and level for more than 100 meters, we never saw it. In places the roads are paved, but in others they were rock collections little more than the width of one 4-wheel drive vehicle. For the record, cars drive on the right. As a practical matter, though, Nuku Hivans drive on whatever side of the road will do the least damage to their cars. It also seems to be local custom to yield to horses, cows, chickens and other livestock which share these roads. 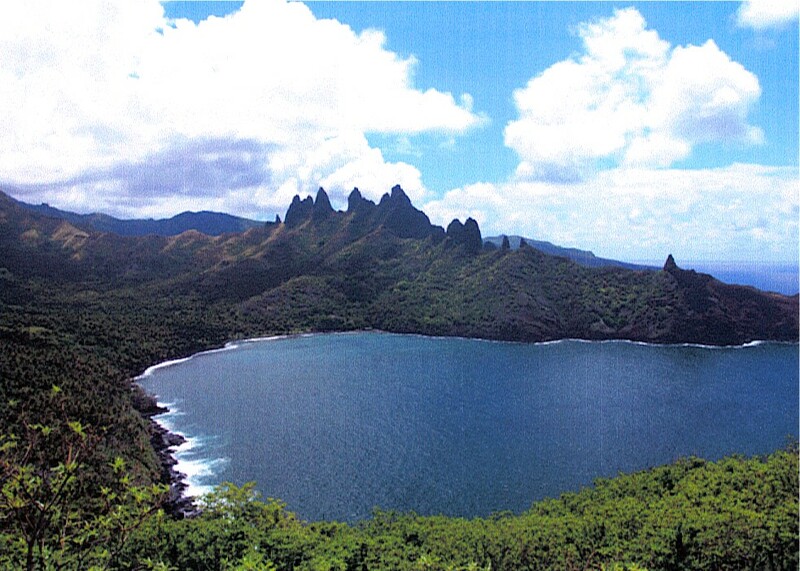 Nuku Hiva is the largest of the group of islands known as the Marquesas, which are part of French Polynesia. If you’re picturing sandy tropical beaches fringing turquoise water, that’s not the Marquesas; they are gorgeous in a different way than, say, Bora Bora. The roads I mentioned climb the sides of jagged volcanic peaks and then spin their way down through forests of fir and pine and acacia… and also breadfruit and mango. Sometimes we would come around a curve on Nuku Hiva and see a vast expanse of ocean; other times we’d see valleys with farmland that reminded us a bit of central New York state. There are beaches here, too — quite beautiful ones — but many of them are more accessible by boat than from land because of the steep cliffs that surround them. One night we talked to a couple of sailors who had recently arrived in Taiohae Bay (where we were staying) on a ketch that had left from England three months before. In this part of the Pacific Ocean, they didn’t have too many options if they wanted to get fresh provisions and launder their delicates. Mexico, the nearest continental land mass, is something like 4,000 miles northeast of Nuku Hiva, and Tahiti is almost 1,000 miles farther south. Well, I suppose they could have gone to Hiva Oa, another Marquesan island. It’s only 100 miles or so to the southeast of Nuku Hiva, and is just as visually stunning. It also has the distinction of being the island where Paul Gauguin lived his final couple of years. There is also a museum in Atuona that has reproductions of many of Gauguin’s paintings. Across the street from it is a general store where you can buy a bottle of cold water, and behind the Gauguin Center is a building that houses some memorabilia of a Belgian singer/songwriter named Jacques Brel. He is also buried on Hiva Oa, just a few steps from Paul Gauguin. Other notable people who spent time in these islands include Herman Melville and Robert Louis Stevenson, who wrote a book that, by sheer coincidence, has the same title as this blog post. A peculiarity of the Marquesas is the time zone, which is a half-hour ahead of the Society Islands, so when it’s 7:00 in Tahiti, it’s 7:30 in Hiva Oa. There are also language differences between those different island cultures which I won’t even attempt to explain, since I don’t have a clue what they are. An endearing thing about the people of the Marquesas was that when we were unable to communicate with words, they spoke to us with gestures and smiles. And even though some of them had never been anywhere else in the world, they somehow knew that they lived in one of the world’s most beautiful places. Because you’ve been nice enough to follow this blog, it’s the least I can do to explore more potential topics. That’s one of the reasons I assigned myself the trip I’m currently taking; the fact that I love to travel has something to do with it, too. After I have returned home and get my laundry in the washing machine I’ll resume posting, but in the meantime, feel free to browse around my blog. See if you can discern a theme to it. (As far as I can tell, there isn’t one.) Thanks again for your frequent visits here — we’ll talk soon! The original Smithsonian Institution Building ("The Castle") -- Washington, D.C. The baby’s father was a British aristocrat named Sir Hugh Smithson, although the duke did not acknowledge the child was his. That was probably because the mother of the little boy was, inconveniently, a cousin of the duke’s wife. The kid was raised in Paris, away from Smithson family gatherings. By then, Macie/Smithson had become a scientist specializing in minerals and chemicals. Among other things, he invented the term silicate; he also wrote a treatise on the chemical content of a lady’s teardrop. As you might imagine, accomplishments like that made him fabulously wealthy. Well, and a hefty inheritance from his mother’s family didn’t hurt, either. Smithson himself died in 1829, and Henry Dickinson died in 1835 — with no heirs. So, in accordance with the bequest, boxes containing over 100,000 gold sovereigns were shipped from England to Philadelphia, melted down and minted into dollars. Smithson’s fortune amounted to $508,318; back then, when Andrew Jackson was president, that was considered to be a large sum. You would think that the U.S. government would have been overwhelmed with gratitude and acted immediately, but Congress — being Congress — bickered for 10 years about what to do with the gift, or if money like that should even be accepted from foreigners. 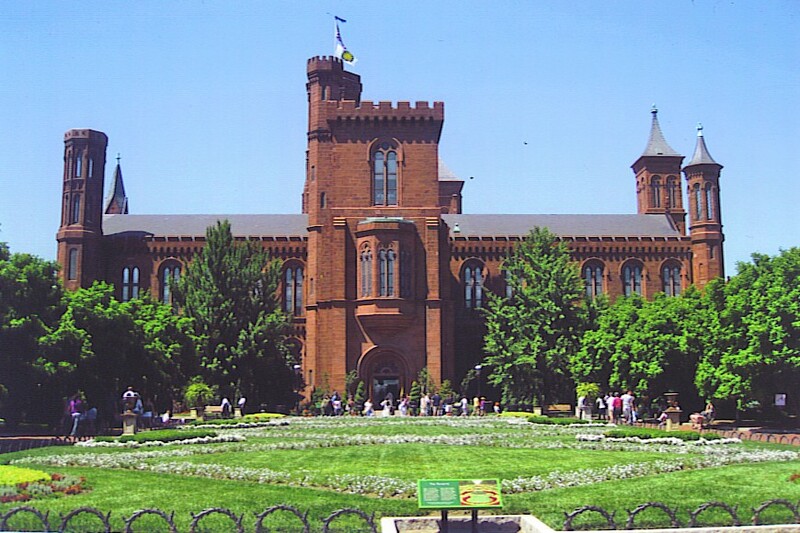 There were several proposals, but the plan that eventually prevailed was the establishment of the Smithsonian Institution. If you’ve seen it, I think you’ll agree that there is nothing quite like it anywhere else in the world. To say that it is a collection of museums doesn’t do justice to the extent of its holdings. In 19 facilities, there are something close to 140 million artifacts and specimens and artworks and documents. The National Air and Space Museum has the Wright Brothers’ plane, and Charles Lindbergh’s “Spirit of St. Louis”. The Apollo 11 Command Module is there, too. The Natural History Museum has mollusks and bones and birds of all kinds — and the Hope Diamond. The National Portrait Gallery has Civil War-era photos by Matthew Brady and famous images of George Washington by Gilbert Stuart. The Museum of American History’s holdings include the Star Spangled Banner, the ruby slippers worn by Judy Garland in The Wizard of Oz, Eli Whitney’s cotton gin (not nearly as tasty as other gins), and Archie Bunker’s chair from All In The Family. The Smithsonian has a National Quilt Collection, a rose garden, a zoo, wallpaper samples… you name it, “America’s Attic” has it. 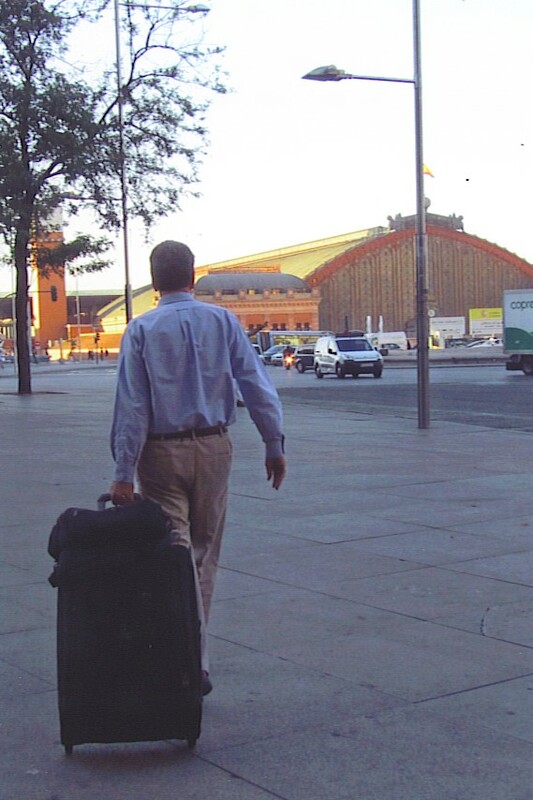 No — regrettably, there is something it doesn’t have: James Smithson’s diaries and papers. In 1865 a fire gutted the original building, destroying most of his personal effects and turning to ashes the best chance later generations of researchers would have had to solve an enduring mystery: Why did James Smithson choose to give his fortune to a country he had never even visited? There aren’t many words in the English language that end with I-E. There’s brownie, movie, eerie, zombie, prairie, wedgie, genie, bookie… OK, so there are more than I thought. What I had previously believed to be a rare example of a word ending in I-E is calorie. It entered the language in the 19th centurie (sorry, century) thanks to a French scientist named Nicolas Clément. He defined it as a unit of heat, and derived “calorie” from the Latin word calor, which means… right, heat. Clément’s calorie was the amount of energy needed to increase the temperature of water by 1° centigrade. That kind of calorie (a.k.a. the small calorie) still has some scientific applications, but the kind we have all learned to dread is actually a kilogram calorie — 1,000 small calories. To avoid confusion, the food-energy calorie is often capitalized, which I’ll start doing now. The Calorie (a.k.a. the large calorie, or in Europe the kcal) was popularized, if that’s the right word, by an American professor of chemistry at Wesleyan University in Connecticut. At the end of the 19th century, Wilbur Atwater invented a device he called the respiration calorimeter, a chamber he used in experiments to basically measure the balance between food intake and energy output of his test subjects. Atwater and his colleagues gave the subjects precisely measured portions of food. Then the subjects, students who stayed in the little chamber for days at a time, would ride a stationary bicycle or perform other tasks. The calorimeter evaluated the heat that the subjects generated. The energy needed to increase one kilogram of water by 1° centigrade came to be known as a Calorie, thanks to articles Wilbur Atwater wrote for national publications in the U.S. The general populace caught on to the notion that all kinds of foods had nutritional values that could be expressed by numbers. Atwater got himself in hot water, so to speak, with temperance groups because he felt duty-bound to report his finding that alcohol had some nutritional value. That fact was soon included in the advertising of companies that made liquor. 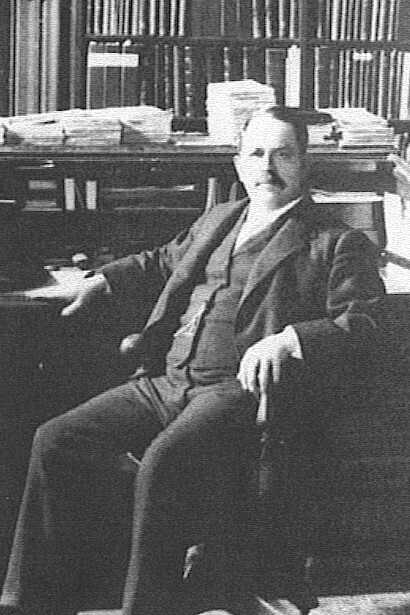 Professor Atwater died in 1907, but his pioneering work was carried on by a Wesleyan co-researcher named Francis Benedict. The book Eating History: 30 Turning Points in the Making of American Cuisine, written by Andrew F. Smith, mentions one of Benedict’s proudest achievements. I had no idea that Girl Scouts of long ago had a role in establishing the Calorie as a scientific unit, but I’ve been aware that their Girl Scout cookies had a role in the extra calories I’m wearing around my waist. Oh, yeah… and come to think of it, cookie is another I-E word. There are people who say that according to the Mayan calendar, the world will end on December 21, 2012. If there’s an upside to these doomsday fantasies, it’s the attention that it draws to what has been a largely forgotten culture. The Maya civilization flourished in Mesoamerica from about AD 250-900 (by our calendar) and then went into a period of decline, effectively ending with the Spanish conquest in the 16th century. There are, however, a number of places where remnants of that civilization can still be seen: Honduras, Guatemala, El Salvador and especially in the Yucatán peninsula of Mexico. 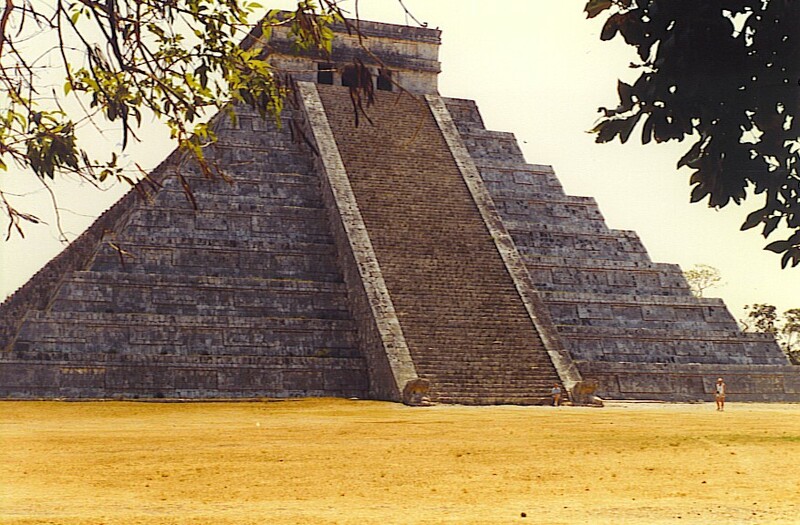 Perhaps the best-known is Chichén Itzá, a UNESCO World Heritage Site in southeastern Mexico. For a lot of tourists, it’s a day trip from the beaches of Cancun — a bus ride of a little over a hundred miles. That’s how we got there, and after fighting our way through souvenir salesmen near the entrance, we had a look around what had once been a good-sized city. There’s a domed building, called El Caracol (the snail), which appears to have once been an observatory. A raised platform with the remnants of pillars is known as the Temple of Warriors. Another impressive structure is the Great Ball Court; stone walls enclose a field that is over 500 feet long and 200 feet wide. Carved into the stone are images of feathered serpents, and of a guy who has recently had his head severed. That seems to be related to the outcome of the games that were once played on this field. When a team finally succeeded in getting a ball to go through a stone hoop mounted about 30 feet above the playing surface, the captain of the winning team was decapitated as a sacrifice to the gods. He didn’t even get doused with Gatorade first. Not far from the Ball Court is the centerpiece of Chichén Itzá, the structure that has become its iconic image. Widely known as El Castillo, it is also called the Temple of Kukulcan in honor of the feathered-serpent deity whose likeness adorns it. It is a step pyramid that is roughly 100 feet high; there are stone stairways on all four sides that rise at a 45° angle to a small room on top. The climb up wasn’t too bad, but coming back down — whoa! Take my word for it, it’s steep. We hung on to a chain and eased our way down, but tourists are no longer permitted to climb El Castillo since one of them had a fatal fall in 2006. The ancient Mayans seem to have had an impressive knowledge of astronomy; the pyramid is laid out so that on the spring and autumn equinoxes, a series of shadows are cast on the northwest side, giving the illusion of a serpent slithering down the staircase. Maybe winter solstice (December 21) would be an interesting time to visit Chichén Itzá, too — especially this year.